Inspection table is equipment consisting of a three – track conveyor with a hood with lighting arrangmenet and visual inspection background of alternate black & white colour. 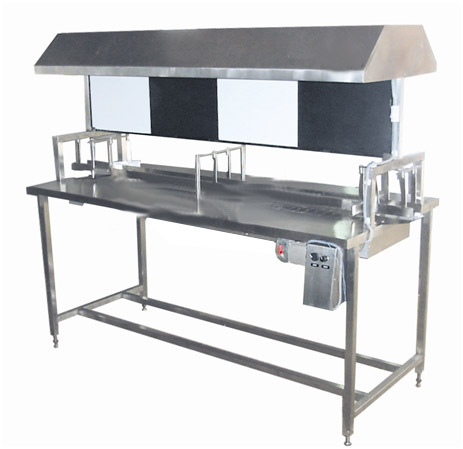 Inspection table have stainless steel structure with moving SS slat chain. Structure made out of SS square pipe & supported on adjustable bolts. The central conveyor belt bings the bottles from the capping machine conveyor. These bottles are automatically bifurcated on the two adjoining conveyor belts & further on the side tables of operators sitting on either side of the table. The operators in turn pick up the bottles & visually inspect the bottles in the alternate white & black background to check for any particles in the liquid filled, sealed & breakage of bottle. After inspection the bottles are placed in the central track which is transfer for labeling.